What Do Dirty Dishes Have to Do With Love? More specifically, I hate loading the dishwasher. While I’m certainly capable of doing it and did it for Â years when I lived on my own, there’s just something about loading the dishwasher that I loathe. Momma would say that it’s no surprise–I wasn’t the neatest, most organized kid growing up, but I definitely was the one most likely to snap if the kitchen was a mess in the house I shared with 3 other girls right after graduation. No one was more surprised than I, let me tell you. So when Todd and I first moved in together, we’d discussed certain chores (mostly laundry, we’re strictly a do-your-own household) but I don’t remember discussing dish duty. We traded off weeks to cook (we still do) but whereas the usual beat would be one person cooks, the other cleans, Todd adopted dish duty 99% of the time. And I thank him for it frequently, because he’s saving me from something a detest and, to me, that’s love. In Gary Chapman’s book, The 5 Love Languages, this pinpoints at least one of my love languages as Acts of Service. If you’ve never read the book (I remember receiving a copy of it as a wedding gift the first time I got married back in ’95), it’s an interesting treatise on different ways we perceive love all with the end goal of making individuals more aware of what they see or hear as love so that they can then communicate those needs to their partner. It’s good stuff. And even though I read this book years ago and knew on some level what I needed, I wasn’t always good at asking for those needs to be met. For instance, I remember a particular row with my 2nd husband over groceries. Well, it was more than that, but the grocery shopping was a catalyst that day. See, his son (who lived with us every other week) had decided to go vegetarian. Seeing as how I’d done similar back in high school (and combined with my culinary training) I was gung-ho to support him and make sure we met his needs while still also meeting the needs of his decidedly carnivorous father. Unfortunately, stepson’s idea of a meal was French bread, Buffalo Chick’n nuggets, and Monster energy drink. I had several objections to a) him subsisting on those items (regardless of how much kale he claimed to consume from the food truck at lunch) and b) the general principle of teenagers consuming energy drinks, so I flat-out refused to buy them in the requested quantities (or at all in the case of the energy drink) and explained to his father exactly why. Instead, I planned meals in components, like the night I made spaghetti, the sauce, and the seasoned meat separately so each person could add what they did and did not want. Stepson opted not to come to the table. Now, he wasn’t rude or obnoxious about it, he was fairly polite saying ‘no thanks’ over the din of the music through the closed door to his bedroom, but it certainly didn’t show respect or appreciation for my efforts. And we just won’t go into the not-so-easy-to-find-12-years-ago Tofurky incident. The aforementioned argument was on who did what around the house, and how much each of us (the husband and I) contributed monetarily. Yeah, it was one ofÂ thoseÂ “discussions.” Since I do better on paper with facts at hand, I listed everything out, comparing our salaries as well (he made a third more than I did, but I matched his amount for the household expenses) and included grocery shopping in my contribution totals saying something like ‘and I get the things you like at the store.’ His response:Â That’s your job! No. No it wasn’t. Especially when even he didn’t come home for dinner most nights for the last year we were together. Playing music and cooking for people are two very tangible ways of showing love. Grocery shopping and planning menus is a chore for some, it’s an act of loving service for others, myself included. Planning favorite meals or picking up a favorite snack or cereal when something more utilitarian would do or it could easily be skipped: they are love notes from me to whomever I’m cooking for. It might sound a bit Stepford wife of me, but it’s what I do. It’s the same thing that drives me to volunteer to help this group or that group even when I’m putting my own projects aside (aka Helium Hand or Helper Monkey-ism), because I love, respect, and/or appreciate the group and want to show it in my “native” love language. It’s also why I seldom feel a true need to pull the ‘fend for yourself’ card when it’s my week to cook. I used to see Quality Time as a key love language along with Words of Affirmation. As I’ve gotten more self-confident, though, they aren’t as important (though Quality Time is still a biggie, it’s just truly quality and not quantity). Back when I was confused about my self-worth, I spoke love to others by almost strictly Physical Touch, thinking that’s what I had to do–again, I’ve since learned that, while important, it’s not the language I need to be speaking exclusively, and certainly not in the way I used to think. About the only one of the love languages I never really keyed into was Receiving Gifts. Not that I don’t love presents, but the gifts language often involves money and growing up without a lot of that around made both giving and receiving such gifts awkward and uncomfortable. Though I enjoy giving gifts to others, they come from the Acts of Service part of me being primarily handmade or diy. 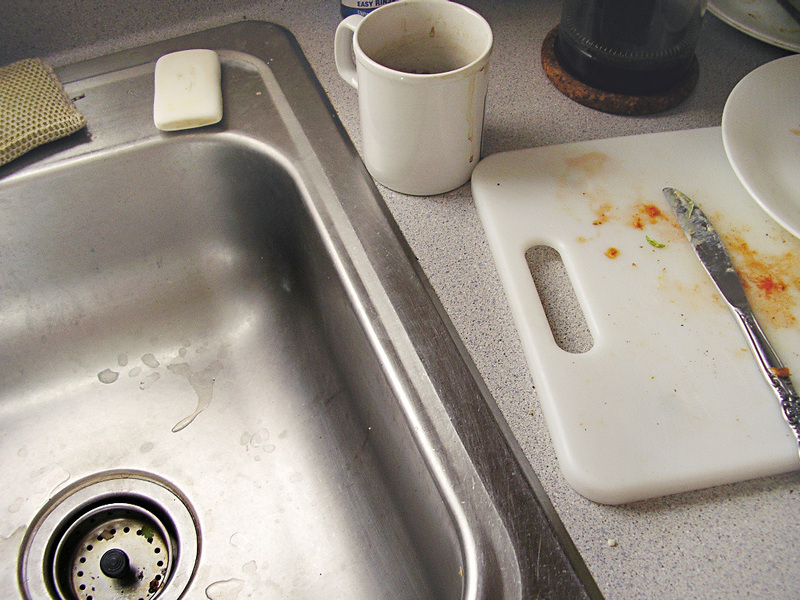 So when I found myself doing the dishes the other night–half because it was time to cook supper and we were out of plates, having not moved over the rest of the kitchen supplies, and half because Todd was exhausted and having a rough week so hadn’t gotten to them in a couple of nights–I didn’t feel all martyr-ish about it. (That, of course, is not Acts of Service if you’re going to complain about how put-upon you are, that’s a passive-aggressive way of asking for Words of Affirmation in my mind.) I was happy to do them, even though it was hand-washing because we didn’t have a working dishwasher and it meant delaying supper a bit, too. I was happy because it was a way I could show Todd that I appreciated what he did for me around the house, the time he frees up by doing the dishes being time I can spend on my projects or nothing at all if I so choose. Todd had never heard of The 5 Love Languages before that night, when I brought them up after supper. We’d never had a need to discuss them as, in the 6 1/2 years we’ve been together, we’ve been lucky enough to speak the same love languages often enough without prompting. There’s a quiz going around about rating the awesomeness of your husband/wife over on Brainfall. I took the rate your wife side, trying to guess Todd’s answers, and scored myself an 80%. When I took the rate your husband side of the quiz, I scored Todd a 93%, and I felt that was fair and I often consider Todd an excellent husband and myself a somewhat selfish wife. When I sent the link to Todd, though, he scored me a 94 while only scoring himself a 73 when he tried to guess my answers. I suppose the lesson is that we both do our best but see room for improvement, while our partner sees near perfection. So much better than the other way around, right? I’ll continue to be grateful when Todd does the dishes, or cooks dinner on “his” weeks, or kills a bug that dares enter our home. What’s more, I’ll continue to tell him how grateful I am so that he knows I see what he’s doing. Whether it’s dishes or cuddles, it all boils down to the same definition of love in our language. YES. THIS. I enjoy cooking. I suppose it’s fulfilling to me, enough anyway, but I don’t often do it for just myself because it’s more about the act of sharing the meal than it is the actual preparation of it. And I also hate doing the dishes. Before we lived together, cooking for myself was an act of self-care, especially when you compare it to take out or poorly formed meals. I hate doing dishes too! Especially when I have to unload AND re-load the dishwasher! (The dishwasher is supposed to make it easier, not create more work, right?) I think it’s really sweet you both scored your partner higher than yourselves! I also love the 5 Love Languages book and think about the principles often. My husband is Quality Time and I’m Words of Affirmation. It’s so interesting how all of us are so different! This is such a great post and I too think it’s awesome that you both scored each other so high (while being more modest about yourselves). That speaks volumes. Also, dishes? YUCK. I hate doing them, but I hate unloading the damn dishwasher even more. And I’ve always meant to read that book. From what you’ve said, I’m definitely a cooking as an act of love/service type. Thanks for reminding me, I’ll have to check it out! After our past relationships, I think we approach this one with a sense of gratitude and appreciation for what the other does as well as what they DON’T do (bring the drama, push buttons, etc.) while acknowledging our individual flaws. Definitely makes for a peaceful, happy home.